Basel Committee issued a Consultative Document “Sound Management of Risks Related to Money Laundering and Financing of Terrorism”. The Basel Committee on Banking Supervision has issued new guidelines, whose main aim is to describe how banks should include money laundering (ML) and financing of terrorism (FT) risks within their overall risk management. The Committee’s intention in issuing this paper is to support countries’ implementation of the FATF standards with respect to their banks and banking groups, by exploring complementary areas and leveraging the expertise available in both organisations. Therefore, these guidelines are intended to be consistent with and to supplement the goals and objectives of the FATF standards. The Financial Action Task Force (FATF) has revised its 40 + 9 recomendations after 2 years of efforts by member countries. The revised Recommendations now fully integrate counter-terrorist financing measures with anti-money laundering controls, introduce new measures to counter the financing of the proliferation of weapons of mass destruction, and they will better address the laundering of the proceeds of corruption and tax crimes. They also strengthen the requirements for higher risk situations and allow countries to take a more targeted risk-based approach. Paris, 22 October 2010 - The Financial Action Task Force (FATF) in order to protect the international financial system from ML/FT risks and to encourage greater compliance with the AML/CFT standards, identified jurisdictions that have strategic deficiencies that pose a risk to the international financial system. The FATF and the relevant FSRBs will continue to work with the jurisdictions below and report on their progress. Click here to read full report. Money laundering risks have increased / decreased in economic crisis ? Why didn't Wall Street firms tell potential investors that the bonds they were selling them were rotten? Why did their business partners, including subprime mortgage lenders, ignore glaring evidence that borrowers weren't qualified and give loans to virtually anyone with a heartbeat? is committed to provide high quality of professional expertise to Financial Institutions through consulting, training and auditing covering Risk Management, Corporate Governance & Regulatory Compliance. Our team of reputed financial service professionals bring decades of expertise, acquired at senior management positions in the financial industry, to serve our client's needs. and a specialist will contact you. 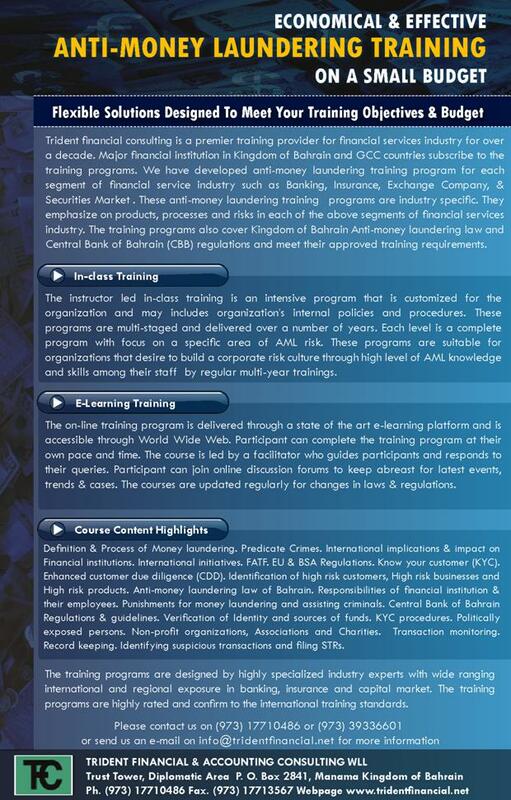 CRMGC launched High Quality Country Specific AML Training for GCC.